On August 14, 1855, John Wilkes Booth, the seventeen-year-old son of the late, great Junius Brutus Booth, made his professional debut upon the stage. For one performance only, John Wilkes Booth performed the role of Richmond in the third act of Shakespeare’s Richard III at Baltimore’s Charles Street Theatre. 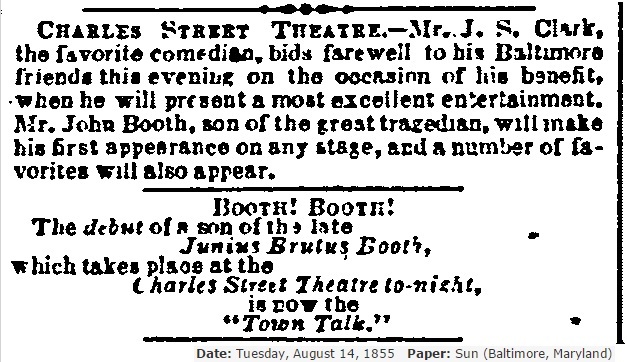 As shown by the above newspaper advertisements, the performance was part of a benefit for Booth’s friend and fellow actor, John Sleeper Clarke. Clarke had known John Wilkes and Edwin Booth from their shared boyhood in Baltimore. The three boys and a few other friends used to perform together in self produced children’s shows for their neighbors, dubbing themselves The Tripple Alley Players. Using makeshift costumes and borrowed props the boys would stage shows in back rooms, stables, or cellars charging their friends a penny for a ticket. These performances definitely made an impact on the boys as four of The Tripple Alley Players would grow up to become professional actors. Clarke’s real name was John Sleeper and he had been nicknamed “Sleepy” by his peers. Seeing how such a name would make him a subject of ridicule on the stage, he wisely chose the stage name of John Sleeper Clarke for the rest of his life. 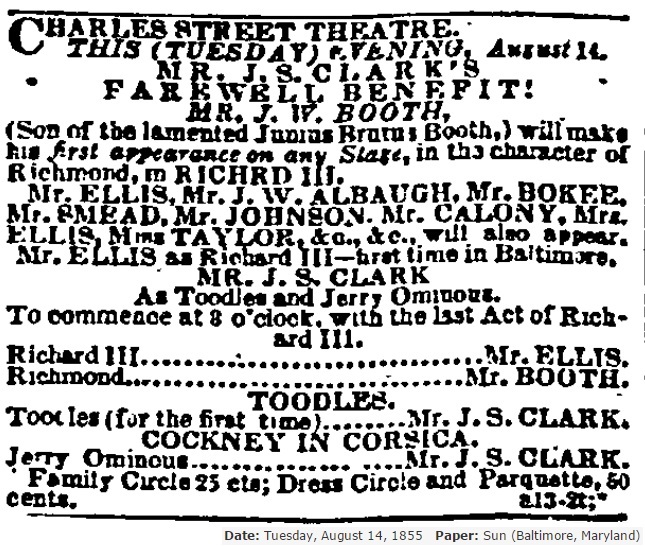 It is interesting to note that this performance was not only the debut of John Wilkes Booth, but also the first time Clarke performed in the play of Toodles. This comedy would later become a staple for Clarke and the role he was best known for. As a benefit performance, Clarke was entitled to all of the box office returns for that night after expenses, so the young actor was eager to draw in as many patrons as possible. 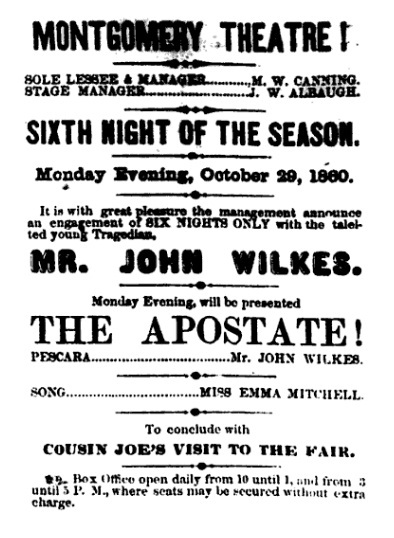 Clarke heavily advertised the debut of John Wilkes, the son of the great tragedian Booth, in order to pull in the largest audience he could. Sadly, there do not seem to be any reviews in the days that followed about John Wilkes’ performance. Booth himself, however, was very happy with his performance. He had not told his family of his intentions to act on the stage for Clarke and so they did not witness his debut. Instead he came riding back to Tudor Hall after the fact to inform them. The story of his return is recounted in Asia Booth’s memoir about her brother and follows below. Please note that the following text demonstrates racial language and views which are not acceptable today but were held by John Wilkes, Asia, and most of the Booth family. He had a greeting for all and threw a packet of candies from his saddle-case far beyond where we stood, saying, ‘After it, Nigs! Don’t let the dogs get it!’ The never-forgotten bag of candies was longingly looked for by the blacks, young and old, whenever ‘Mars’ Johnnie’ came from town or village. Mary Ann Booth was right on the money when she expressed her belief that Wilkes had been used for the sake of his name in his first performance. Clarke asked his friend to perform, literally, for his own benefit. 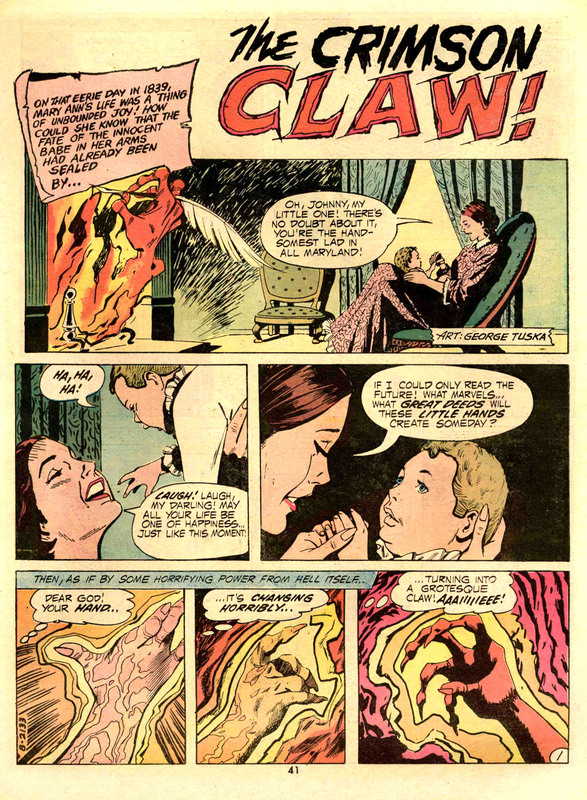 Even from early on, Clarke understood the power in the Booth name and sought to gain from it. Later he would go into business with Edwin Booth and then come into the family by marrying Asia. However, even if Clarke’s inclusion of John Wilkes as an actor stemmed from his own self-interest, he did help foster the young man’s growth. When the next theatrical season began, Clarke got John Wilkes a job as a stock actor in Philadelphia. From here Booth would start down the road of learning his craft. Thus, it is from this minor performance in Baltimore’s Charles Street Theatre, that John Wilkes Booth’s career as an actor began. 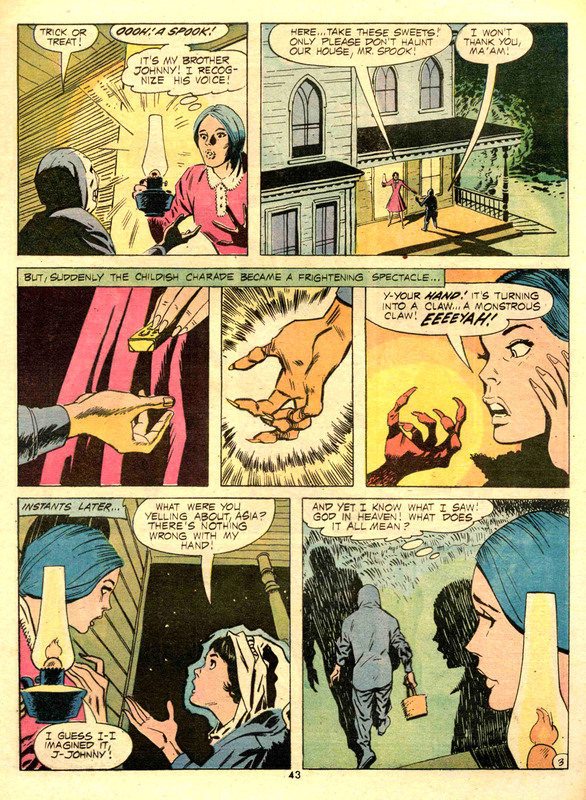 For this week’s Grave Thursday we are dealing with the death of a place, rather than a person. 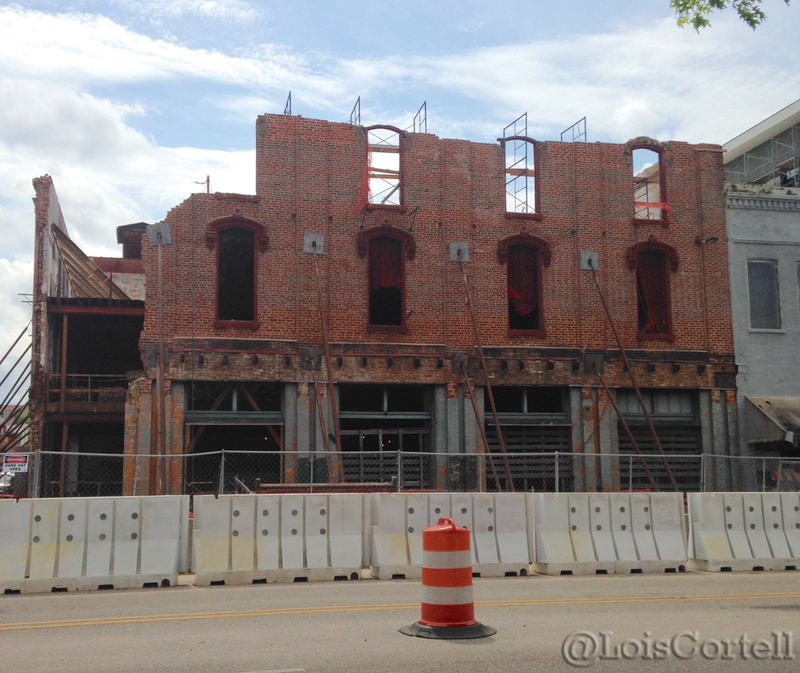 The place is the old Montgomery Theatre in Montgomery, Alabama which is currently in the final phases of demolition. 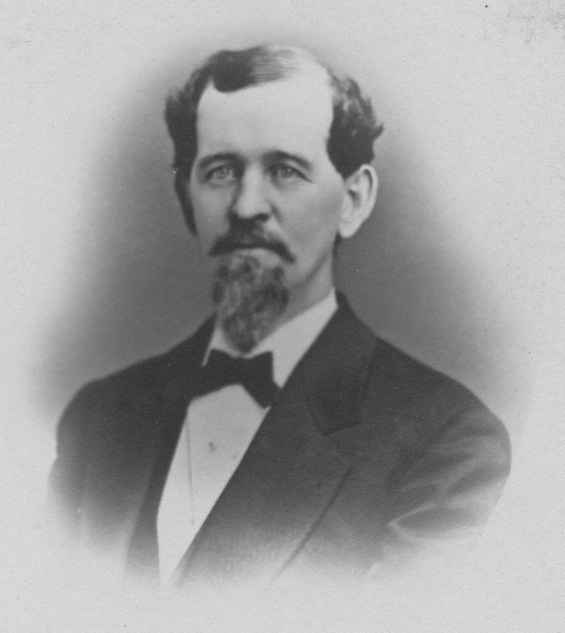 In the fall of 1859, Colonel Charles T. Pollard, president of the Montgomery and West Point Railroad, commissioned the construction of a new theater in Montgomery, Alabama. The brick contractor was B. F. Randolph who used his female slaves as the laborers for the theater’s masonry and plastering. By October of 1860, the large and stately Montgomery Theatre was completed. The first lessee and manager of the theater was Matthew Canning, who opened the theater with his troupe of actors on October 22, 1860. 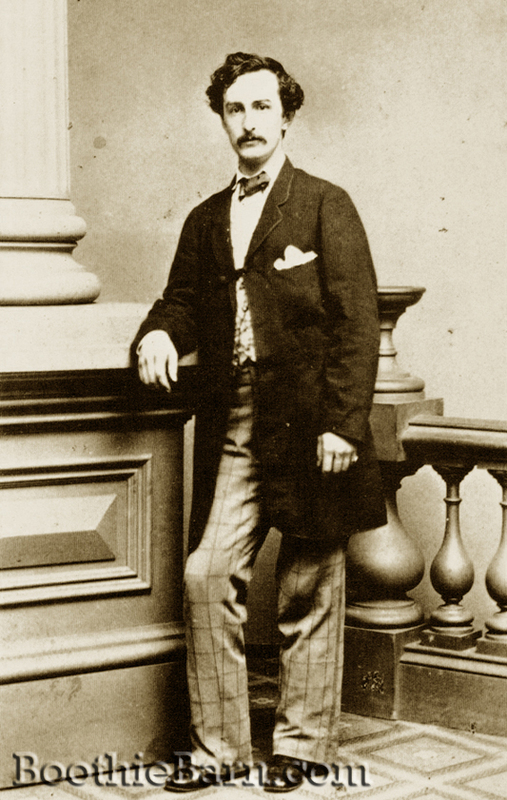 22 year-old John Wilkes Booth was part of Matthew Canning’s troupe of actors. Booth’s tour with Canning was his first as a star performer. Prior to this he had been learning his craft in Philadelphia and Richmond. Attempting to succeed on his own talents rather than his prestigious family name, he had been and was continuing to be billed “J. B. Wilkes” or “John Wilkes”. When the Canning troupe presented the grand opening performance of the show, School for Scandal, at the Montgomery Theatre, John Wilkes Booth was not present. Ten days earlier, when the troupe had been in Columbus, Georgia, Booth had suffered an accidental gunshot wound to his thigh. Though stories differ, the most reliable account holds that Booth and Canning were attempting to clean a pistol when the weapon accidentally discharged. This gunshot wound ended Booth’s performances in Columbus and caused him to sit out most of his starring performances in Montgomery as well. 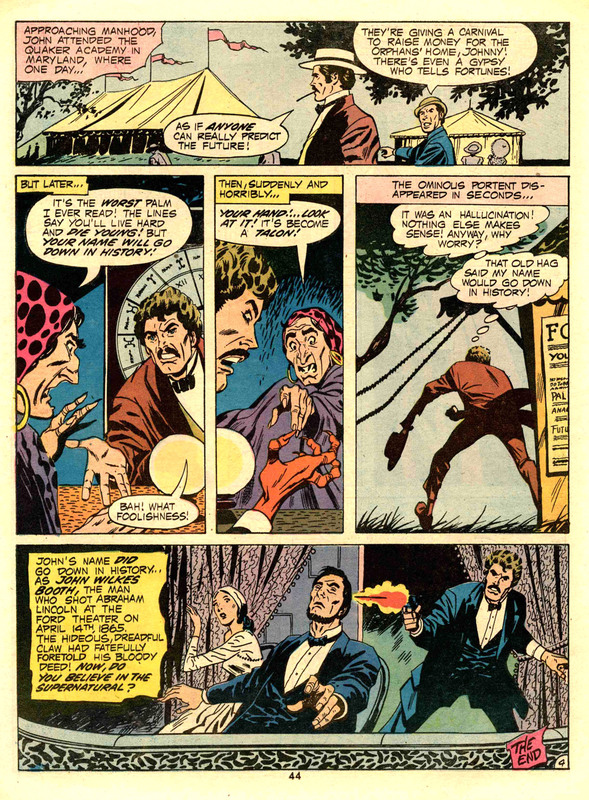 John Wilkes Booth finally made his debut at the Montgomery Theatre on Monday, October 29, 1860, when he performed as Pescara in The Apostate. He would perform for the rest of the week before closing his engagement to recuperate further. John Wilkes Booth was resting in Montgomery, Alabama when Abraham Lincoln was elected the 16th President of the United States on November 6, 1860. 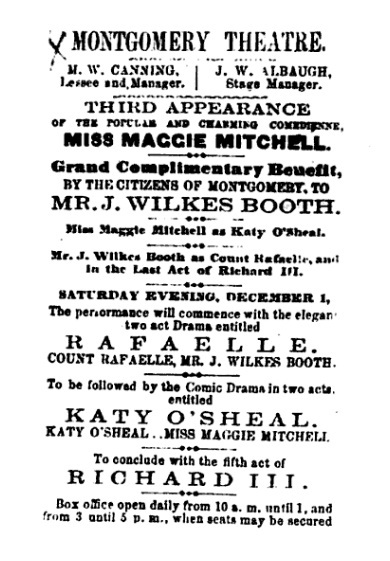 On November 16, Booth returned to the stage of the Montgomery Theatre in a benefit performance for his fellow actor, Kate Bateman. Booth played Romeo to Bateman’s Juliet. The troupe’s final day at the Montgomery Theatre was on December 1, 1860 in a benefit performance for Booth himself. Booth performed in a two act play called Rafaelle, the Reprobate, and then his fellow actor, Maggie Mitchell, performed in Katy O’Sheal. The evening was ended with Booth performing the titular character in the fifth act of Shakespeare’s Richard III. This performance marked the end of Booth’s engagement in Montgomery but it also marked a new beginning for the young actor. It was on the stage at the Montgomery Theatre that John Wilkes Booth reclaimed his true name and was billed as J. Wilkes Booth. From this day onward, the actor would always use his true name. John Wilkes Booth would never return to Montgomery, but the beautiful theater he helped to christen would continue to operate for many years. 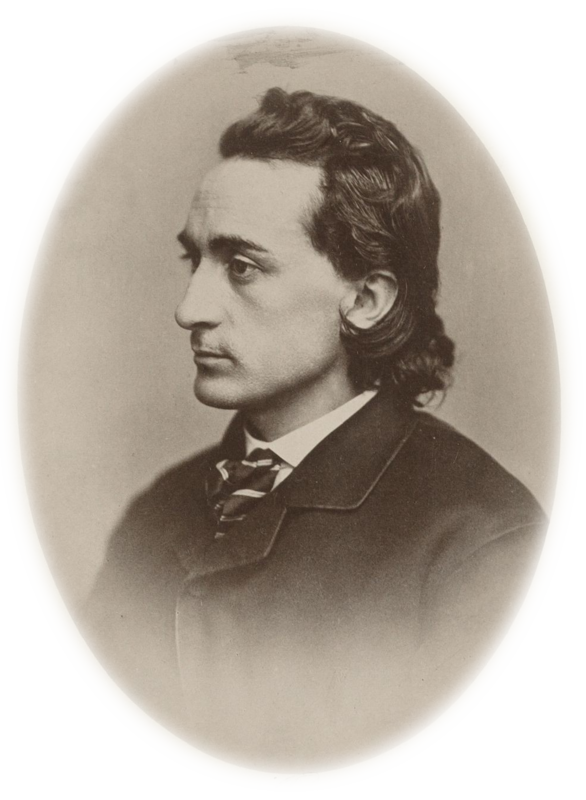 Edwin Booth would perform on the same stage in 1876, 1882, and 1888 along with countless other luminaries of the stage. After 47 years of operation, the Montgomery Theatre was closed on November 13, 1907 when a newer, grander theater was opened in the city. The old theater’s interior was remodeled into a department store but the outside retained its original construction. The Webber department store lasted until the 1990’s when it finally closed. After a few years the building was bought by a foundation which paid almost half a million dollars to replace the roof. 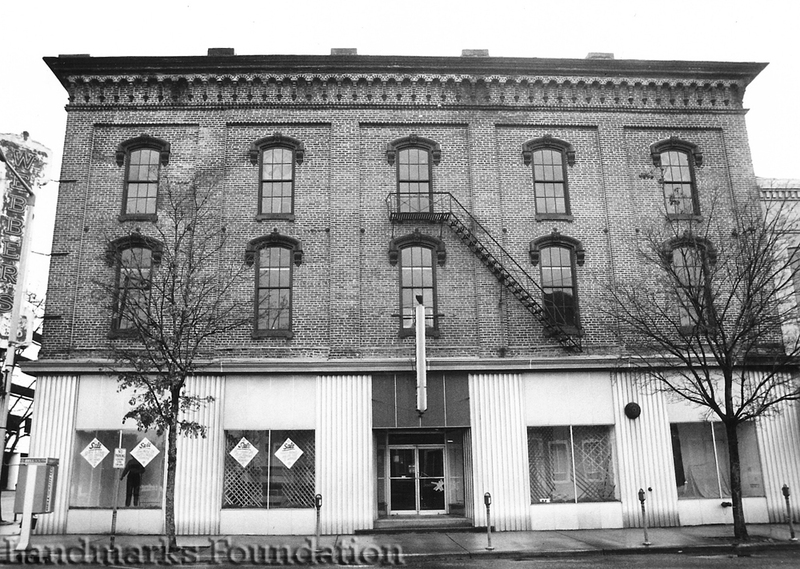 In 2010, the foundation sold the building to a developer who planned to restore the structure and create retail and housing space within the interior. Unfortunately while work was being done to restore the building in June of 2014, the structure suffered a partial collapse. 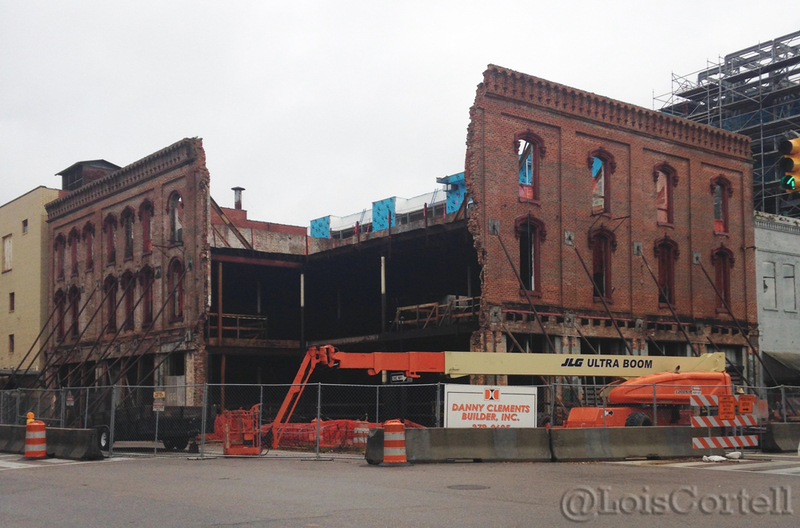 Though the Montgomery Theatre building could not be saved, deconstruction of the building has been slow to allow for the salvage of some of the structure’s cast iron, bricks, and masonry pieces. Some of the windows of the theater are also being saved and will be given to the local historical society. “Wednesday night, November thirteenth, the curtain was ‘rung down’ in the old play-house to give way to one of more modern construction. The soft glow of unforgotten scenes alone is left to me, and many whose hearts have throbbed with hope for future years, as nightly we ascended the broad stairs from the street to listen to and witness scenes of comedy, music, and tragedy. Thus is marked the passing of the glory of the old Montgomery theatre…There is not one of us who has not gone up the wide stairs loving, and come down them loving the more. There is not one of us who has not left some weight of the soul there and never returned to claim it. Posted on March 16, 2017 by Kate H.
A Happy Women’s History Month to you all you researchers out there. This is Kate, taking over for Dave today. For this Grave Thursday, we are going to discuss the strong willed social activist and suffragist who not only gave the Union one of its most recognized anthems but also wrote a lesser known, though equally beautiful, poem for the Booth family. 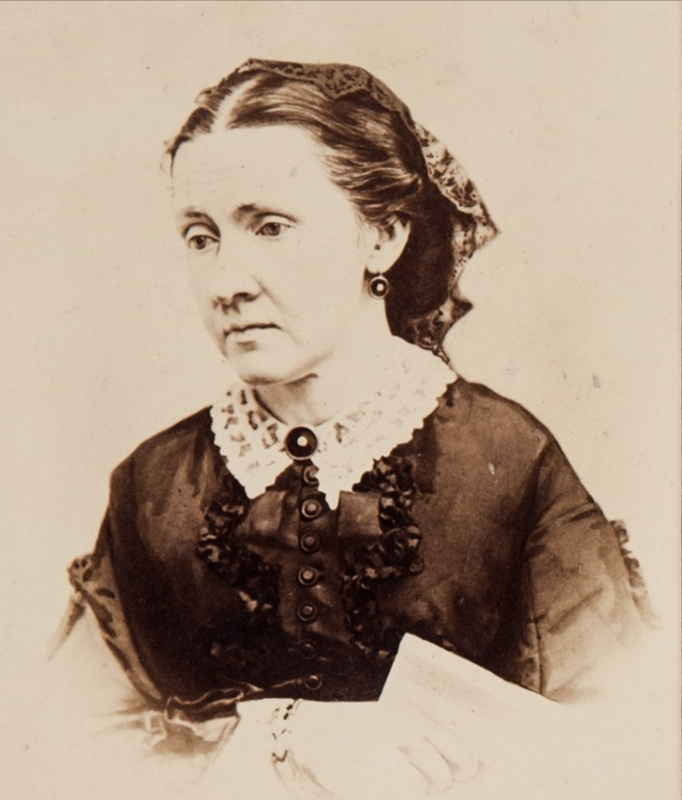 Julia Ward Howe is most often remembered for transforming the lyrics of “John Brown’s Body” into the patriotic hymn “Battle Hymn of the Republic.” This is rather appropriate considering her husband, Samuel, was a member of the Secret Six, a staunch abolitionist group that financed John Brown’s raid on Harper’s Ferry. However, Howe wrote many other poems during her lifetime that were never set to music. And here, through the summer heats, and in spite of many wasps, I wrote my five-act drama, dreaming of the fine emphasis which Mr. Booth would give to its best passages and of the beautiful appearance he would make in classic costume. He, meanwhile, was growing into great fame and favor with the public, and was called hither and thither by numerous engagements. The period of his courtship and marriage intervened, and a number of years elapsed between the completion of the play and his first reading of it. At last there came a time in which the production of the play seemed possible. Charlotte Cushman and Edwin Booth were both in Boston performing, as I remember, but not at the same theatre. They agreed to act in my play. E. L. Davenport, manager of the Howard Athenaeum, undertook to produce it, and my dream was very near becoming a reality. But lo! On a sudden, the manager bethought him that the time was rather late in the season; that the play would require new scenery; and, more than all, that his wife, who was also an actress, was not pleased with a secondary part assigned to her. A polite note informed me of his change of mind. This was, I think, the greatest ‘let down’ that I ever experienced. It affected me seriously for some days, after which I determined to attempt nothing more for the stage. In time, Howe’s friendship with the Booths extended to their daughter, Edwina. Much later in her life, Howe maintained a correspondence with Edwina Booth, even after her father’s death. In 1908, just two years before Howe’s own death in 1910, the 89 year-old Howe sent two poems to Edwina. According to the accompanying letter, Edwina, who was 48 at the time, had come across two poems that had been in her father’s possession. She believed one or both of them to have been written by Howe many years before. Edwina asked Howe to write her name below the verses she recognized as her own so she could correctly identify them. One of the pieces included with the letter was authored by Mary Elizabeth Blake, though Howe mislabeled the work as belonging to poet T. W. Parsons. The other poem, which was the work of Howe herself, was entitled To Mary. This poem had been written by Howe in 1863, upon her attendance at the funeral for Mary Devlin Booth. What wert thou in the moment of thy stay? More briefly than thyself scarce bloom and die. And Life’s warm ripple sunned thy marble o’er? From Juliet’s courtship to Ophelia’s grave. The heaven bound anchor of a sinking heart. What was my office in Love’s sacred past? What was she, here in silken shell empearled? But my life’s life – the comfort of the world. John Wilkes Booth was the only Booth sibling who was able/willing to attend the funeral service of his sister-in-law. John Wilkes cancelled his upcoming acting engagement and hastened to Cambridge to be with his grieving brother. 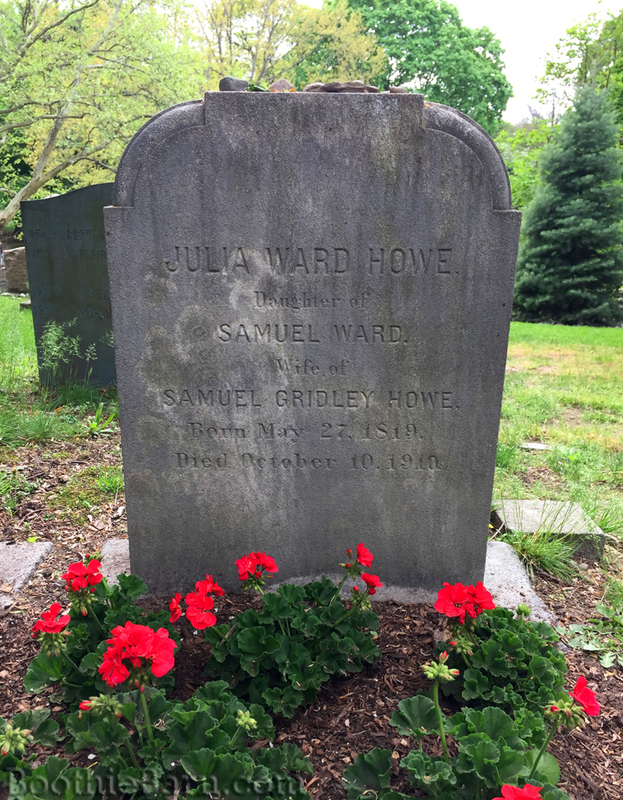 Though life expectancy in the nineteenth century was much lower than today, Julia Ward Howe was one of the exceptions to the rule, living to the old age of 91. During that time, she buried her own husband at Mount Auburn Cemetery in a grave about 80 yards away from Mary Devlin’s. In 1893, Howe returned to Mount Auburn to mourn the loss of Mary’s husband, Edwin. She returned to Edwin’s grave a year later when his beautiful monument was unveiled. P.S. By Dave: Julia Ward Howe stated that one of her greatest disappointments in life was that the play she had written for Edwin Booth was never performed. After Howe’s death, actress Margaret Anglin sought to rectify this oversight. During her engagement in Boston in March of 1911, Anglin received permission to perform Howe’s forgotten play. Hippolytus was performed for one night only on March 24, 1911 with all the proceedings going to benefit the Julia Ward Howe Memorial Fund. The title role, which had been written for Edwin, was played by Walter Hampden with high praise. Years later, Hampden would become the fourth president of Edwin Booth’s private club, The Players. Today, the research library housed in The Players is known as the Hampden-Booth Library. On March 3, 2017, Kate and I presented at an event for the Friends of Rich Hill and the Society for the Restoration of Port Tobacco. The event venue was the restored Port Tobacco courthouse in Port Tobacco, Maryland. Though Port Tobacco is the former stomping grounds of conspirator George Atzerodt, the subject of this event was the lead assassin, John Wilkes Booth. While I have given speeches about Booth in the past, including my 2016 speech for the Abraham Lincoln Presidential Library and Museum volunteers, I had never previously attempted to portray John Wilkes Booth in the first person. The event in Port Tobacco, billed as “An Evening with John Wilkes Booth”, was my first attempt at being John Wilkes Booth, rather than just discussing John Wilkes Booth. The following play is meant to provide an insight into the mind of John Wilkes Booth by utilizing much of his own words and writings. Some of the words said by Booth are uncomfortable to hear, but they are vital if we are to truly understand the world view of Lincoln’s assassin. The video of the performance is embedded below or you can watch it directly on YouTube by clicking here. If you are interested in more first person portrayals of conspirators, Kate will be performing as Mary Surratt twice in April, 2017. On April 1st, Kate will be performing her one woman show about Mrs. Surratt’s imprisonment at the annual Surratt Society Conference in Clinton, Maryland. To sign up for the conference please visit the Surratt House Museum’s website. Kate will also be portraying Mary Surratt at an event in Port Tobacco, Maryland on Friday, April 7th at 6:00 pm. At this performance, Mrs. Suratt will be joined by George Atzerodt and the two of them will discuss their involvement in the conspiracy against Lincoln. The event at Port Tobacco is free and open to the public. EDIT: I just realized that today is the five year anniversary of my very first posting here on BoothieBarn. When I started this site, it was an outlet for me to share some of the interesting things I had learned while researching the Lincoln assassination. I didn’t really know if it would be of interest to anyone other than myself. However, through this site I have made many wonderful friends and have been fortunate enough to speak about John Wilkes Booth and Lincoln’s assassination in several venues. And so after 5 years, 400+ posts and almost 600 followers later, I want to thank you all for your much appreciated support. As long as I keep finding interesting things about the Lincoln assassination to share, I expect posts will continue here on BoothieBarn for many more years to come. At about 4:00 am on the morning of April 26, 1865, Dr. Charles Urquhart, Jr. was hastily awakened from his bed in Port Royal, Virginia. The doctor was just a little shy of 65 years old and had been the resident physician in Port Royal since he first moved to Caroline County from Germanna, Virginia in 1821. Over the last forty years, Dr. Urquhart had become a pillar of the Port Royal community, serving not only as town doctor but also as a deacon at St. Peter’s Church and master of the masonic lodge in town for about 10 years. In 1853, Dr. Urquhart had married Louisa Care, a long time neighbor of his who was about 30 years his junior. The pair’s only child, a daughter named Finella “Nellie” Urquhart, was born in 1861. The Urquhart family owned several pieces of property in Port Royal but made their home right on the shore of the Rappahannock River. Their home was located just a few yards away from the landing for the ferry that ran between Port Royal and Port Conway on the other side of the river. The good doctor may have been accustomed to receiving late night/early morning visitors who were in need of medical attention, but nothing could prepare him for this unique house call. 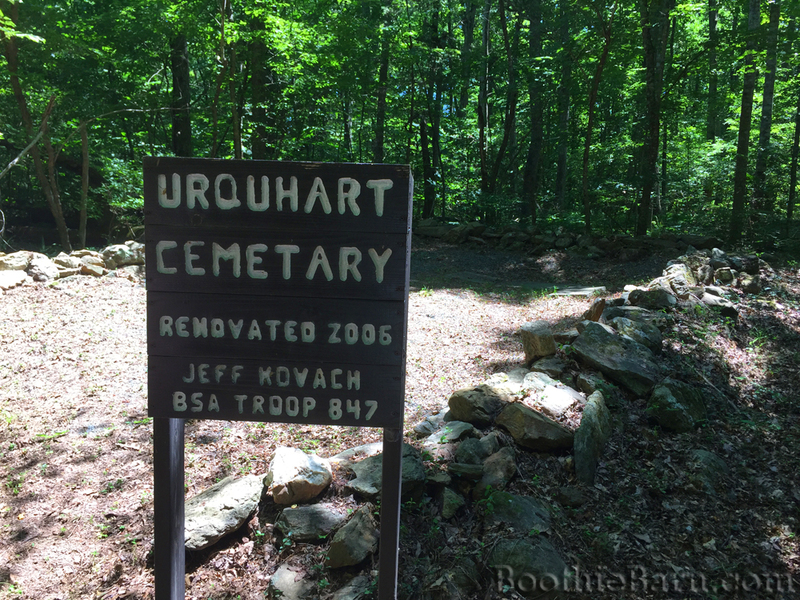 Upon answering the door, Dr. Urquhart was met by a Union soldier who hastening him to get dressed and come with him a few miles south of Port Royal to the farm of Richard H. Garrett. By following the soldier’s command, Dr. Urquhart rode into the pages of history. 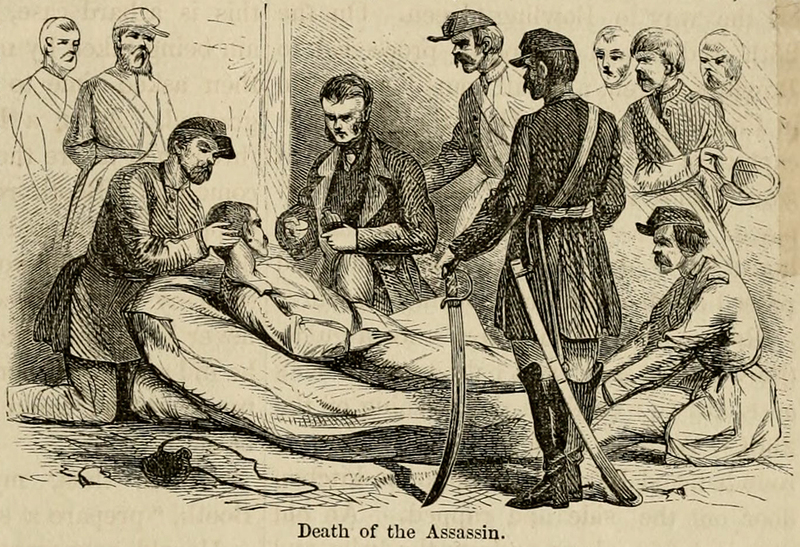 It was at the death of John Wilkes Booth that the Garrett family procured a small remembrance of the man they had unknowingly cared for during the past two days – a small lock of the assassin’s hair. There are many stories about who exactly cut the lock from Booth’s head, with one of the stories giving the credit to Dr. Urquhart. Lucinda Holloway, Mrs. Garrett’s sister and live-in teacher of her children, later told the story of Booth’s death to a newspaperman. The reporter then wrote, “A little struggle just as [Booth] died threw a lock of his jet black hair over his marble white forehead, which Dr. Urquhart clipped off at the request of Miss H[olloway], she thinking it would be a sweet memento for some friend or relation of his.” It would take a few years but eventually, in 1878, Edwin Booth did receive from the Garrett family a lock of hair cut from his brother’s head at the time of his death. It was not, however, the complete lock of hair the family had procured. The balance of the treasured item remained in the Garrett family for many years more. Despite his brush with a note worthy event, it does not appear that Dr. Urquhart ever recorded his thoughts on being present at the death of John Wilkes Booth. In truth, however, he didn’t have that much time to reflect on his involvement with history. 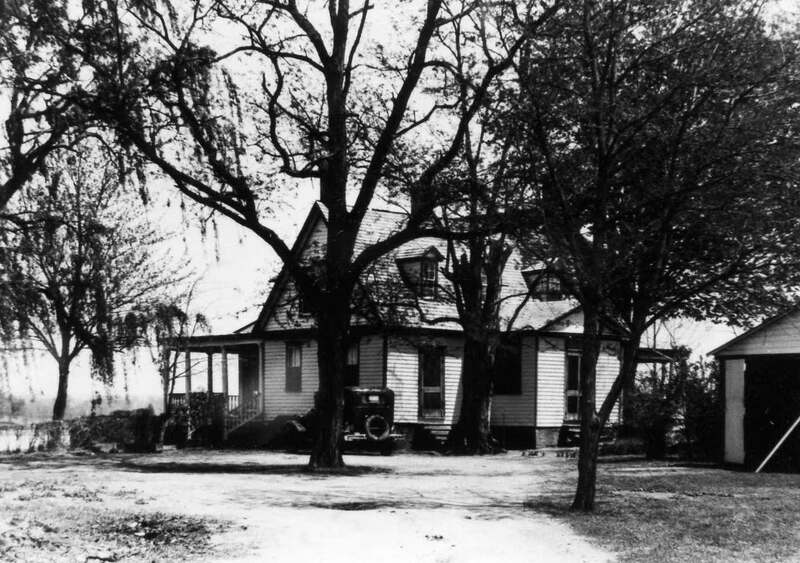 In June of 1866, Dr. Urquhart and his family went to visit his sister-in-law in Culpepper, Virginia. While enjoying their hospitality Dr. Urquhart suffered a stroke that left him speechless. Knowing his condition was mortal, he was able to make his final wishes known through writing. He asked to be buried alongside his mother in the family burial ground in Germanna. 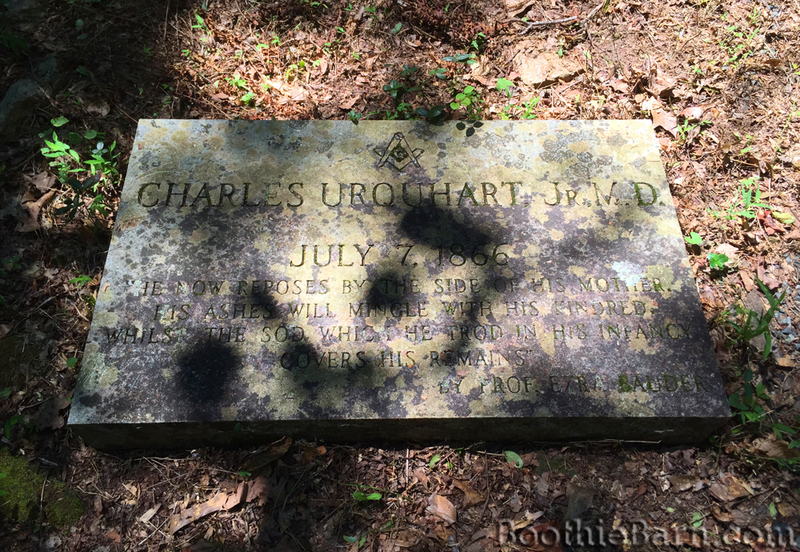 Dr. Charles Urquhart, Jr. died on July 7, 1866. In the 1980’s an effort was made by Carroll M. Garnett, a descendant of one of Mrs. Urquhart’s sisters, to put a marker on the grave of Dr. Urquhart. This task was accomplished on April 12, 1983 with a special ceremony. The quote for Dr. Urquhart’s memorial comes from the letter written by his brother-in-law after his death. At the 1983 ceremony a foot stone for Dr. Urquhart was also put in that read “The Physician who Attended John Wilkes Booth, Garrett’s Farm, Caroline County, VA, April 26, 1865”. In the years since the dedication ceremony, however, this foot stone has gone missing. The other proposed highway marker was to be near what is now the Brawdus Martin Germanna Visitor Center in Locust Grove, Virginia. It is from this visitor center that the Germanna Foundation continues to care for the Urquhart Family Cemetery. 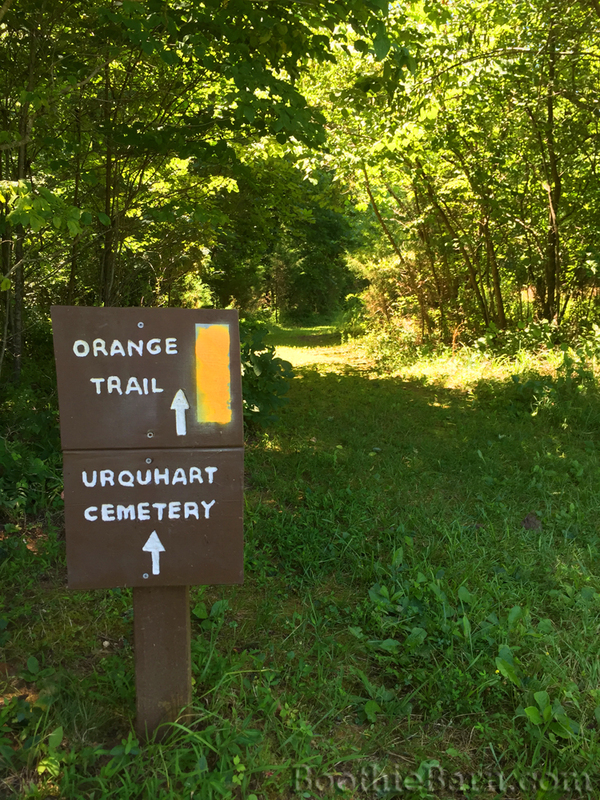 One can visit the cemetery by parking at the visitor center, which is adjacent to Germanna Community College. The Foundation has cut a path through the grass and woods that leads right to the Urquhart cemetery. Dr. Charles Urquhart was probably pretty tired after being awakened so early on the morning of April 26, 1865. It is altogether fitting, therefore, that, “he is now sleeping his last sleep,” under the trees of his family burying ground in Germanna. In the spirit of Valentine’s Day and the many poems being shared today, here is a poem written by John Wilkes Booth in February of 1860. This poem by Booth is an acrostic poem and as such the beginning letter in each line spells out the names of the poem’s recipient and author. Here is a transcript of the poem including Booth’s incorrect spelling of the words distressed and despair. May all good angels guard & bless thee. And from thy heart remove all care. Remember you should ne’re distrest be. Youth & hope, can crush dispare. Joy can be found, by all, who seek it. Ne’re forget the wish of – John. Booth wrote this poem as he was learning the acting trade in Richmond’s Marshall Theatre. The date of this poem places it just a couple of months after Booth had returned from his soldiering. For two weeks in late November and early December Booth had stood guard at the imprisonment and execution of abolitionist John Brown. When he returned to his theatrical company only the pleas of his friends allowed him to rejoin the troupe after his impromptu departure. 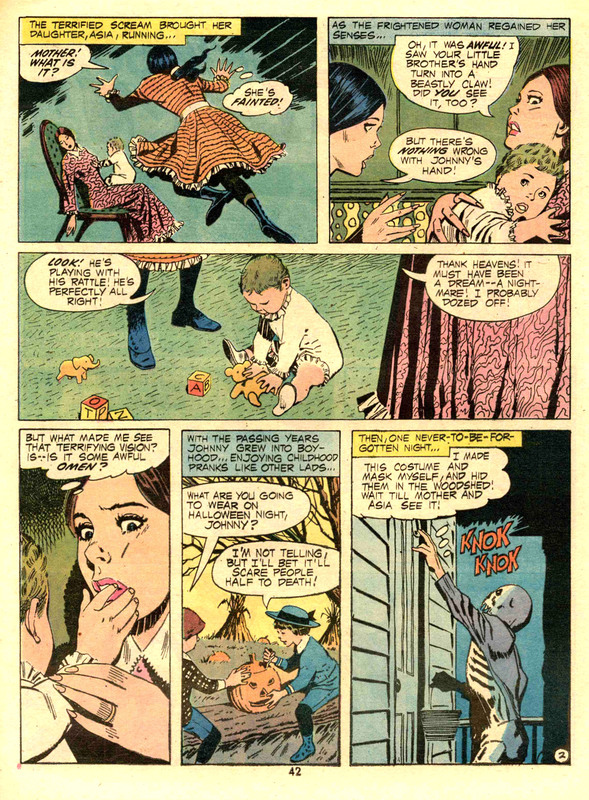 At this point he was still being billed, when his minor part warranted any sort of billing that is, as Mr. J. B. Wilkes. The recipient of this poem was a woman by the name of Mary C. White. Little is known about her. Booth’s poem is located in a “Forget Me Not” autograph album that is inscribed with Ms. White’s name and the words “Richmond, Va. December 10 1859”. In addition to the poem by Booth, there are also other farewell like notes from W. H Caskie (a Richmond native who would later join the Confederacy), George Wren (a fellow actor in Booth’s troupe), two poems signed under the aliases of Fido and Junius (not Booth’s brother), and Samuel Knapp Chester (another troupe member and a man Booth would try to recruit into his abduction plot against Lincoln in the future). 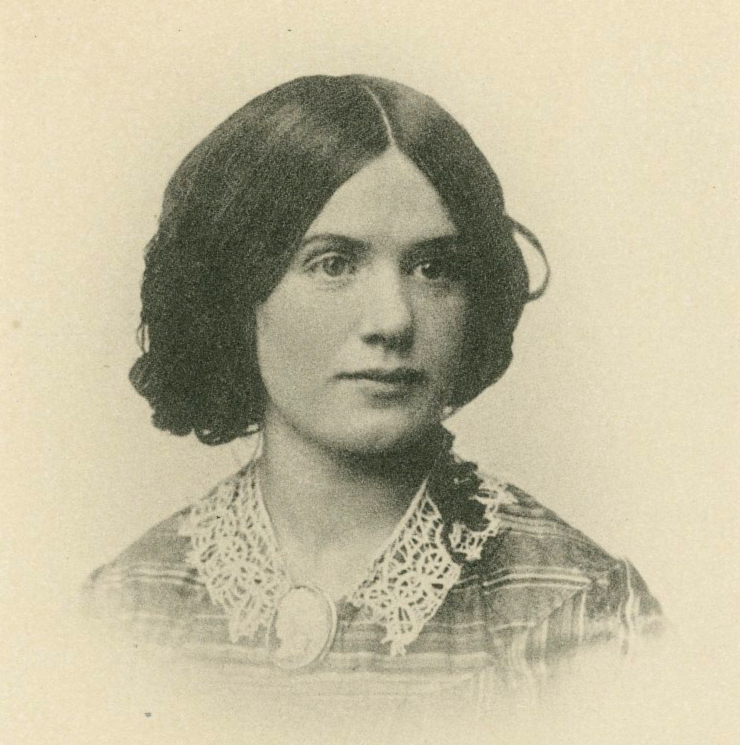 In their book, “Right or Wrong, God Judge Me”: The Writings of John Wilkes Booth, editors John Rhodehamel and Louise Taper suggest that Mary C. White might be a fellow actress. They cite an entry in T. Allston Brown’s History of the American Stage, which is essentially an early encyclopedia of actors and actresses, for a Mary Ann White “attached to the Richmond, Va. Theatre for some time” who “died 1860, in that city, June 20”. 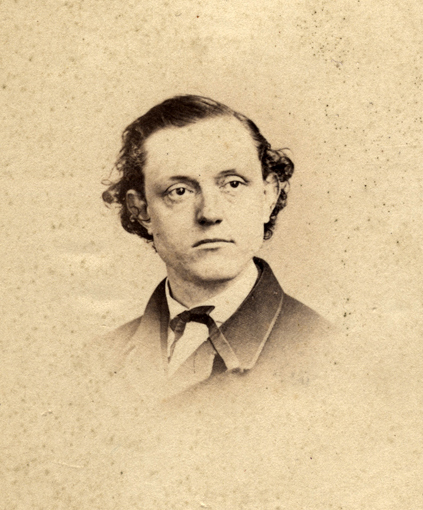 Rhodehamel and Taper point out that there are no other poems or farewells in the album past June of 1860, which might coincide with the owner’s death. I have been unable to find a record of a Ms. White in the theater troupe, but, if she was young, as many of the poems about her allude to, she may have played only minor roles in which she would receive no mention in the papers. I’m not 100% convinced Ms. White was an actress, but without more information, it’s as good a guess as any. The album containing Booth’s signature is in the collection of the Abraham Lincoln Presidential Library and Museum in Springfield, Illinois. Kate and I were fortunate enough to see it in person after my talk to the ALPLM’s volunteers last summer. The ALPLM has digitized this poem and many other Booth related items they acquired from the collection of Louise Taper. You can see more of their digitized items here. You’d be amazed what you can turn up nowadays with a just Google search and a friendly inquiry. A few weeks ago I was working on the Maps page of BoothieBarn looking for more sites around the country that have a connection to the Lincoln assassination. While most of the time I’m looking for the graves of certain individuals involved in the story, for some reason I decided to change my method and focus on an certain city and see what I could turn up by Googling. For no reason in particular, I chose Omaha, Nebraska as a place to search for folks connected to the assassination. I happily discovered that Omaha is the final resting place of Pvt. Augutus Lockner, a Union soldier who was saved by conspirator Lewis Powell in December of 1864. If you want to read more about that fascinating story, pick up the second edition of Betty Ownsbey’s book, Alias “Paine”: Lewis Thornton Powell, the Mystery Man of the Lincoln Conspiracy. I also stumbled across an article from the Omaha World-Herald in which the newspaper went behind the scenes of The Durham Museum to see some of the objects in the museum’s large and varied Byron Reed collection. One of the items mentioned in the article was a playbill from Edwin Booth’s namesake theater (pictured). After tweeting out the image of the playbill, both myself and Carolyn Mitchell from Tudor Hall, the home of the Booth family, sent a message asking The Durham Museum if they had any other artifacts connected to the Booths or the assassination. The collection’s manager graciously searched their archives and found four other playbills for Booth’s Theatre and two 1865 newspapers announcing the news of Lincoln’s death. The collections manager also informed us that the Byron Reed collection contained a letter written by the avenger of Lincoln himself, Sergeant Boston Corbett. She kindly photographed the letter and sent the images to us. I then contacted Steve Miller, a fellow assassination researcher and the foremost expert on Boston Corbett. I was happily surprised to find that this letter was a new discovery for him and that he had not yet come across it during his years of research. Working together, Steve and I were able to produce a transcript of the letter which had been somewhat damaged with age. Corbett wrote the letter to his former commanding officer, the then Lieutenant of the 16th New York Cavalry that tracked down John Wilkes Booth and David Herold, Edward P. Doherty. Writing on December 1, 1866, Corbett is responding to Doherty’s request for an affidavit relating to his role in the capture of Booth. Before sharing the letter, however, some historical context is needed. On July 26, 1866, Representative Giles Hotchkiss of New York presented to the House of Representatives the findings of the Committee of Claims in reference to the reward money. Prior to this, the War Department had presented Congress with their recommendations of how to divide up the money. Mr. Hotchkiss’ committee took the War Department’s advice when it came to the division of monies for the capture of Jefferson Davis and only made a few changes to the War Department’s allotment for reward money for the arrests of George Atzerodt, Lewis Powell, and Mary Surratt. However when it came to the reward money for capture of Booth and Herold, there was much debate. Rep. Hotchkiss’ committee put forth a bill recommending that Gen. Lafayette Baker, the head of the National Detective Police who sent detectives Everton Conger and Luther Baker with Doherty and the 16th New York into Virginia, receive $17,500 in reward money. Detective Conger was also to receive $17,500. Luther Baker would get $5,000, Lieutenant Doherty would receive $2,500, and Corbett and the rest of the 16th NY would each get $1,000. This allotment did not sit well will some of the other members of the House. Several felt it unfair for Gen. Baker to receive such a lion’s share of the reward money when he was not even present at Booth’s capture. Rep. Hotchkiss replied that Gen. Baker had been the mastermind of the entire manhunt and therefore desired the highest amount, with Conger receiving the same amount since he was in charge of the group that captured Booth. This point about Conger being in charge was disputed by Lieut. Doherty who had produced papers to counter the claim. However, within the House of Representatives there was great sympathy for Everton Conger since he was a veteran who had been wounded earlier in the war. As the debate over amounts continued, Hotchkiss seemed to become angry with his fellow lawmakers. One of the other congressmen tactlessly pressed Hotchkiss to provide more money for one of his constituents who aided in the manhunt, noting how he had presented this claim to Hotchkiss personally and was disappointed to see how little had been allotted. This exasperated Hotchkiss, leading him to express that this whole matter had been trouble from the start. Hotchkiss said he had consulted the mountains of reward claims that had been submitted to the War Department in an effort to divvy up the money as best as he could, noting that there was no protocol for him to follow. He did not like the insinuation that he was playing favorites, noting that neither Gen. Baker or the other claimants were friends of his and that he was merely doing, “the duty I was called upon to perform”. “During this session a telegram has been shown me from Lieutenant Doherty, saying that there was a great fraud being perpetrated here, and he wanted the American Congress to stop the wheels of legislation and wait until he could be here. Lieutenant Doherty has been here pretty much all winter, and has been before me time and time again in regard to this matter. I have had rolls of documents from him, and I wish to avoid saying anything about him. But now, since he has had the impudence to come here and charge a man who has been engaged in the honest discharge of his duty, without fear or favor, one who is a stranger to all these men, who does not care personally whether they get a cent, and since gentlemen have shown the want of confidence in the committee to make the remarks they have, I feel constrained to say that I believe Lieutenant Doherty was a downright coward in this expedition. Hotchkiss then points out that despite his strong belief that Lt. Doherty was an coward who deserved no portion of the reward money, the committee still allotted him some funds “in deference in part to popular clamour”. While Hotchkiss provided a defense of the committee’s reasoning for their proposed reward allotments, he didn’t feel it worth a prolonged fight. After an hour of debate, Hotchkiss was tired of the insinuations from his colleagues and just wanted the whole mess to be over. Another representative had put forth an amendment to his bill, changing the amounts provided for Booth and Herold’s capture and, in the end, Hotchkiss did not fight it and the amended bill was approved. “When you cannot do as you would, you must do as you must,” Hotchkiss stated. The amended bill still gave Everton Conger the largest share of reward money at $15,000, a decrease from Hotchkiss’ $17,500. General Lafayette Baker dropped way down from $17,500 to $3,750. Luther Baker fell from $5,000 to $3,000. Ironically, it was Lt. Doherty, Boston Corbett, and the rest of the soldiers who benefited the most from this amended bill. Doherty’s reward money went from $2,500 in Hotchkiss’ bill to $5,250 in the amended version. Corbett and all the other soldiers also got pay increases from $1,000 to $1,653.84 each. In the end, it would be these amounts that would be passed in the Senate and given out. While Doherty ended up receiving a good deal of money, when he learned of what Giles Hotchkiss had said about him on the floor of the House of Representatives, remarks that were carried in newspapers around the country, he became very offended at the attack on his honor. On August 1st, while stationed in South Carolina, Doherty sent off a letter to the New York Herald promising a rebuttal to Hotchkiss’ lies. “I cannot remain quiet under such charges affecting my character as a soldier, and my conduct as an officer, coming from such a quarter. In the course of a short time I shall place before the people of the United States such evidence as will convince them that the charges made by the honorable member are untrue. The language used by the member from New York, did not come to my notice until after the adjournment of Congress, and when I no longer had an opportunity of vindicating myself before that body. Chance has connected my name with a great historical event; and I simply desire that the army with whom I served, and the people for whom I fought, should know that in the performance of my duty I was not a laggard and a coward. “God bless you, my dear sir; the slander and lie that was told by Mr. Hotchkiss, in Congress, about you, makes me love you more than ever. And I do not believe that such a wicked lie and such a malicious slander will be allowed to go altogether unpunished, or to have the effect on the public mind that was intended. I do not doubt, though, that it did have the effect desired in Congress; and I do truly believe that it was told and used there for the express purpose of getting the largest share of the reward for the Detectives, and getting the military into disgrace, and consequently the small apportionment that was made to us. I do without hesitation pronounce the assertion that you was under a shed, and that the Detective could not force you out, to be a wicked lie. For I well know that you not only commanded the party, but commanded it well; and at the time that the house and barn of Mr. Garrett was surrounded, it was done by your orders; and that you took the leading part in all that was done there, as also in the whole expedition. I am aware, also, that you placed me next in command to yourself before leaving Washington, giving me charge as acting orderly sergeant, and had you been killed I should myself have been in command of the party, and not the Detective. I am also aware of the fact that when you got track of the assassins, you had to send men after the Detective (Conger), who was off in another direction at the time. The injury that has been done us by giving us a small share, instead of the principal share of the rewards, cannot now be remedied, since it has passed Congress in that way. But be assured, dear sir, that I stand ready to give a certificate at any time, properly attested if needs be, that I have ever known you to be a brave and efficient officer, and never in my life saw any act on your part that indicated cowardice in the least degree. I always liked to go on a scout with you, because I knew you to go forward in the work, and a true officer and soldier, having the welfare of your command always in view, and losing no opportunity of doing good service for your country. As grateful as Doherty must have been for Corbett to come to his aid, Hotchkiss’ slanderous remarks apparently continued to gnaw at the lieutenant. Over three months later, on November 26th, Doherty wrote another letter to Corbett seemingly asking the late sergeant to write out a more thorough or perhaps notarized affidavit regarding Doherty’s services in apprehending Booth. It is Boston Corbett’s letter to Doherty’s second communique, months after the Hotchkiss affair, that is housed in The Durham Museum in Omaha. Even though Corbett had written in August of 1866 that he stood ready, “to give a certificate at any time, properly attested if needs be,” regarding Doherty’s actions and character, in this response to his former commander in December of 1866, it appears that Corbett is trying to get Doherty to put the whole incident aside. Your letter of Nov 26th reached me yesterday. And as I was not sure by the heading of it wether [sic] it meant South Carolina, or Lower Canada; I concluded to write to you for the Address in full; And also to suggest that it might be best to drop the whole matter; And let it end as it is. For my own part as a Christian I freely forgive Mr. Hotchkiss for the injury that he has done; And so would rather let end thus. But if you still insist upon the Affidavit being made to clear your character, I feel that I owe it to you to do it. And so would not further refuse. But while I sincerely desire to see your Character Vindicated: how much rather would I see your soul saved, And you brought to love and serve God with all your heart. I expect you think it very strange that I appear so indifferent to that which is a point of honor; but the secret of it all is this the Christian knows that the time will soon come when the secrets of all hearts will be made bare in the judgement And he feels that he can well afford to be hid about here. So that he stands justified there. This with me is the only cause of reluctance to make the Affidavit, which I believe I can do with a clear conscience if you think best after reading this. Will you please inform me if you have taken any steps to get the Local Rewards collected. When I was in Washington to get the Amount that Congress Awarded me, I went to Johnson, Brown & Co, at the Intelligencer Building and put my interest in their [sic] hands to collect for me. They advised me to consult with you, which I fully intended doing before, but rather expected to hear from you. They have written to the Pennsylvania Govt. and received Answer by Official Document which I have. That this Reward was on condition that Booth be taken in the State. Please direct to 91 Attorney St. Mr. Peck is out of Business now and no longer holds the store where I was working. Boston Corbett was a deeply devoted Christian almost to the point of being a zealot (the man castrated himself in order to avoid the temptations of the flesh, after all). While his preaching helped to bring hope to his fellow prisoners at the Andersonville prisoner of war camp during the war, I highly doubt Lieut. Doherty was pleased to find that Corbett had responded to his request for help with a lesson on Christian forgiveness. After side-stepping the issue of Hotchkiss with his talk of saving Doherty’s soul, Corbett then went into a topic he knew would be of mutual interest to them both: more reward money. While both of them had received their share of the reward money offered by the federal government, Corbett mentioned his attempt to procure some of the smaller rewards that certain states and cities were offering after the assassination of Lincoln. He apparently made application in Pennsylvania for a reward they had offered, only to learn that the reward was contingent on the fact that Booth was actually found in Pennsylvania. Coincidentally, Doherty was pursuing the same type of course with a reward that had been offered in D.C.. It’s possible that Doherty’s renewed desire to get an affidavit from Corbett was not just to seek vindication against Hotchkiss, but was designed to strengthen his bid for this local reward. Doherty certainly did not want to be maligned again as he sought a portion of the $20,000 the city of Washington had offered. This is especially true since most of the major players from the federal rewards case sought out their own share of the D.C. rewards as well. For the D.C. money, Doherty was once again up against General Baker, Everton Conger, and Luther Baker. But the other claimants quickly grew as the case went through the courts. Washington was not as willing to pay out their reward and so the legal process lasted years. Lieutenant Doherty had submitted his claim in November of 1866, and by September of 1870, the case was still unresolved. By that time the number of claimants had swelled to 39, and rather than fighting with each other over who should get what amount, they were all working together to force D.C. to pay out the money they had promised. In the end, however, their case was dismissed when the judge determined that the city of Washington, funded by Congress, never had the authority to offer the $20,000 reward in the first place. The only legitimate reward the claimants could have hoped for in the city of Washington was the federal one which had been paid out in 1866. This letter by Boston Corbett provides a new look into the unique mind of the man who avenged Abraham Lincoln. It is also a great artifact for teaching about the drama and intrigue that was involved in the avengers’ quest for reward money. I’m thankful to The Durham Museum for sharing it with us. It never hurts to ask a museum what they might have hiding in their collections. As shown from this letter, the results can be pretty interesting.